Ask fellow campers about "Charlestown Breachway" and nearby attractions. Question: We are a military family renting a camper for the first time and we would love to hear any advice on things newbees forget about when visiting Charlestown Breachway. I know there are no hookups. Are there bathrooms and or showers? Are all the sites drive in/thru or back in? The state's website says 30' is the largest size camper. Does anyone know if a 31' tow behind would fit or if would they allow it? Thank you. Thank you in advance for your time and assistance. Answer: Come in with a full tank of fresh water and empty holding tanks. No showers, there are pit toilets but they are not always open. Max RV size is 40' for most sites, the sites near the boat launch are shorter. Sites are either back-in or pull-in based on RV type. Don't forget sunscreen and a bucket with water in it is nice for rinsing the sand off your feet. This place gets really busy during July and August, it can be tough getting in and out of sites. But doable with spotters. I cant say anything more that hasn't been already been said about the beauty and serenity of Charlestown Breachway, it is paradise with a slight downside...The rules of this state park clearly states NO ANIMALS. Don't get me wrong, I love animals and have dogs of my own. We have been camping at the Breachway for 40 or so years, and then about 7 or so years ago campers started showing up with their pet dogs. Some say they are therapy dogs. Some are but most are not. Each year it seems more and more dogs are allowed in. I'm sure there are pet friendly campgrounds around, go there if you have pets. The state needs to enforce this rule better at Charlestown Breachway. I haven't yet and don't need to step into a pile of poop which I have seen and avoided...enough of that rant...everything else there is perfection, beaches are raked daily, the park is always free of litter, everyone is friendly, car parking is tight during the summer months..as always, we will be back again and again. We camped at Charlestown Breachway in a Travel Trailer. Location, location, location. That's what Charlestown Breachway is all about. Hard to beat being RIGHT on the ocean for $20/night. We camped in our Roadtrek and kept the back doors open at night to listen to the surf and catch the breeze. Beautiful. Fellow campers are very friendly. Convenient to beach and kayaking/fishing. Yes, space is VERY tight. This is not a campground but rather a parking lot with space for your camper & table/chairs/awning. Just know going into it that you are here for the location. We found the staff to be very friendly and accommodating. Our stay involved 2 site transfers (best we could do given how last minute we booked). Check out is 11am. Neither of the campers leaving the site we were moving to were out by 11 but the staff worked with us to get them moving. Now let's talk generator use. It's a problem. Generator use is allowed 8am-8pm and there are folks who run it the WHOLE time. There are no rules as to where you can place your portable unit. The guy next to us put his at the rear of his coach, which was right outside our coach. Very loud & gasoline smell ALL DAY. Some regulations on generator use would be very welcome. Have 2 hour windows for generator use would be much better. A few people brought their home generators to use and those were particularly loud. Rules in this area need to change. But truly, that is the only downside to this place. We'll be back! We camped at Charlestown Breachway in a Motorhome. So many great restaurants in the area. Charlestown Mini-Super is about 2 miles away for groceries. Several bait & tackle within 1-2 miles (for ice too!). Campers here are allowed 1 guest car per site for a small fee ($6). Beach is less busy than others in the area (East, Watch Hill, Misquamicuit). One change since our last review here is that the sites are now marked at the sides. So you can setup anywhere between the markers as long as you do not go past them. The old rule was to center your camping unit on the rock with the site number on it. This created problems when a MH was pulled in next to a 5th / trailer that was backed in. You would be door to door and very close. The markers allow the units to create some separation. But it can still be really tight here. We camped at Charlestown Breachway in a Motorhome. This place is still all about location. You just cannot find places right on the ocean for the money. We arrived early April and found only two other RV's in the park. Absolutely secluded and beautiful beach location. We own a 20' RV and since there's no dump station nor water AND you have limited grey/black tank storage you must conserve and be smart about use or you'll have to drive to the nearest dump site 15 min. You can use a generator but it's only allowed until 8 pm. I've had family and friends stay here over the summer and its wall to wall campers with loud generators and cramped for space, the bathrooms in April were closed to us. If you're looking for serene and quiet I'd go off season as we will do so in the Fall. If they'd allow generators to go to 10 pm I'd give it a better rating. Not an issue if you have the larger RV's, a challenge if you have ones with limited power and water capacities. We camped at Charlestown Breachway in a Travel Trailer. There is a Walmart on RT 1. Park still gets a 10 for location. But during July and August there simply are too many vehicles in it. Getting set up can be a real challenge. One big problem is that the Department of Environmental Management is now in an office, so after the parking vendor leaves at 5:00 pm the gate booth is unmanned. So some folks with sites have all kinds of family and friends coming in to visit. This park is much better just before and after the peak summer season. We camped at Charlestown Breachway in a Motorhome. This is an open area parking. Since it was off season only a few campers were here so it was pretty quiet. Extensive beach for walking, fishing, and small boating could be seen. We had cold evenings, nice sunsets and sunrises. There are no amenities so it's dry camping. Good restaurants nearby. We stayed 3 days. We camped at Charlestown Breachway in a Motorhome. This is a State of Rhode Island park that is walking distance to the ocean. It is a parking lot that holds 75 RV's, and you must be self contained to stay here - no hookups. They do have about 7 bathrooms (fancy pits? ), but they were not open when we were there, only opening up Memorial Weekend until Labor Day or the end of the season. There are about 10 sites right on the Breachway where one can fish off of rocks, and every site has a view of the Breachway or the pond. $14 is in state fee, the out of state fee is $20. There is no dump station here, but you can use the one at Burlingame State Park about 15 minutes away. This campground can be used as a base to tour all the seaside communities in this section of RI with some great seafood restaurants. 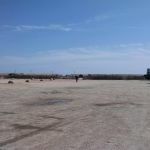 What this campground has is a beautiful beach two minutes away from your site and a great fishing area and boating area. One can also kayak or canoe the pond. The weather was great when we were there, so the sunsets and sunrises were spectacular! Good spot to watch birds and deer across the pond. The only negative is that we do not tow a car behind our RV and others that do many times park their cars behind your RV so that you can't get out. If their RV or 5th wheel does not fit into their sites including their cars there is parking in the general public parking lot for them, but who wants to pay extra. It was not crowded in early May when we went so it was very enjoyable. If you did not know that this campground was there as you take the road to Charlestown Beach you might think you had taken the wrong road, but you continue between the beach and the public parking lot past a lot of summer houses and the road ends at the Breachway. Great place for a stopover or to spend a week at the beach. They do take reservations online through Reserve America. We camped at Charlestown Breachway in a Motorhome. Although we rated the park at a 7 due to a lack of amenities, we give it a fun factor of 10. If you've never been, "GPS" yourself to Charlestown Beach Road, and then follow it to the very end. We knew the sites would be tight, but we were surprised at how difficult it was to get into the site. The key to this park is to arrive early so you have more room to maneuver. The sites are also not clearly marked. When we arrived, our neighbor took the liberty of moving a couple of feet over into our campsite. When we arrived, he wanted us to move over even more since we were on the end (#40). By the time all was said and done, there was 5 feet from our doorstep to his class C. This park would do well to remove 6-8 campsites, spread them out a bit more, and clearly mark them. 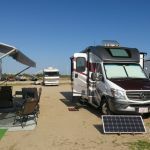 The other thing that makes parking tight is that you have to park your tow vehicle in front of your site, or use the parking lot on the western side of the campground, which fills up fast. We witnessed a Class A take off part of his bumper trying to get into his site around a parked truck. When they say "self contained", they mean it! There is not even a hose for a water fill-up. Water can be filled and you can dump at Burlingame State Park, which is 7 miles away. The people were very friendly and the scenery was spectacular. We swam, fished, rode bikes, went crabbing in the tide pools, and could see the fireworks at the nearby seafood festival. We will definitely go back. We camped at Charlestown Breachway in a Travel Trailer. If you like the water, you just can't beat this place. There are zero hookups but our Verizon cells and broadband worked extremely well. The restrooms are all new. No showers or anything else. It is still location, location, location here. We camped at Charlestown Breachway in a Motorhome. If you dry camp it is a good place to be on the beach. The sites are crazy tight though. It took me some great effort to park and I have been doing this for a while now. The place is awesome, but the state should invest in new bathrooms. There was a sign that said "Not for Human Consumption" in the bathroom. They could also provide showers and drinking water. You have to travel to Burlingame State Park for Water & Showers...both very nice there. I would go back just because of the fishing & calming. We camped at Charlestown Breachway in a Fifth Wheel. Basically this is parking lot for RV's on the water. Great view with swimming, fishing kayaking, boating, and digging for clams. Dry camping of course, but not that bad. No showers make it difficult to clean up after being at the beach, however, you can drive to another State park to shower. All in all, pretty cool place to check out. We camped at Charlestown Breachway in a Motorhome. Location, location, location. This place is right on the ocean and breachway. Self contained units only, so it is a great place to put your RV to its full use. We also spent 10 nights here in May. 7 nights is the limit, but managers discretion for additional nights and that was pre season. RI is going to a reservation system so next year it will be tough to get a site on weekends. Now you just showup during the week and your in. We camped at Charlestown Breachway in a Motorhome. Great location- view of channel, but not the ocean due to sand dune and public parking lot. Tightly packed campground. Do not try to get a space here on a Friday or Saturday. Locals said best time to arrive is on a Wednesday. We camped in a 40' Bluebird and had to ask a few patrons to move their vehicles so that we could squeeze in. No reservations are available here. We camped at Charlestown Breachway in a Motorhome. Are you affiliated with Charlestown Breachway ?